Les Parures du Vent, literally translated “Ornaments of the Wind”. Joachim Metz captures in great detail, some of the most interesting hood ornaments of luxury cars, some of which no longer in existence, such as the Hispano Suiza. Hispano-Suiza (Spanish-Swiss; translation) was a Spanish automotive company founded in 1904, famous for its luxury cars prior to World War II. 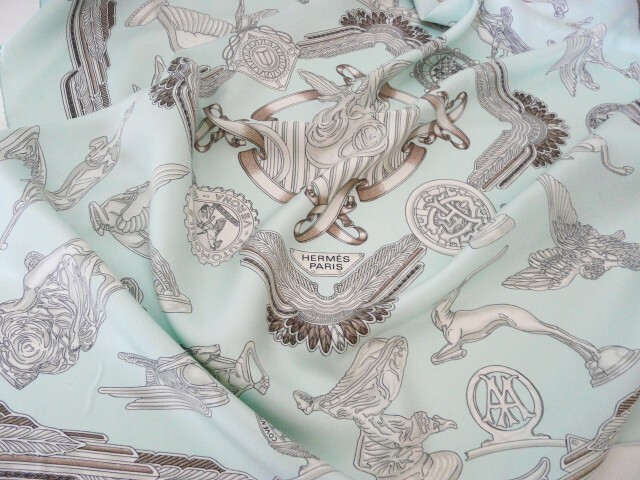 Other companies, such as Jaguar and Rolls Royce are also represented on this gorgeous scarf. For good fun, Metz incorporated several car clubs such as the Automobile Club of Verona and the Automobile Club de Picardie et de L’Aisne.